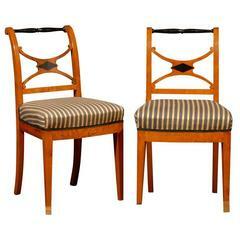 A pair of Italian leather and walnut side chairs from the 18th century. This antique pair of hall chairs from Italy feature tall shapely backs with stylized arch chest rail, beautifully turned front legs and side stretchers, with double turned-wood stretcher bars across the front. Rear legs are squared and have a squared stretcher bar along the back. Seats and backs have leather upholstery, and are adorn in nail-head trim. The old leather has some areas of wear and cracking, so please refer to the additional images for further detail. 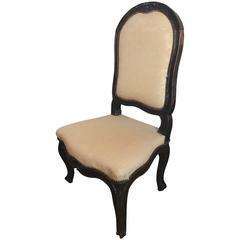 These exquisite Italian chairs would look perfect around a dining room table. 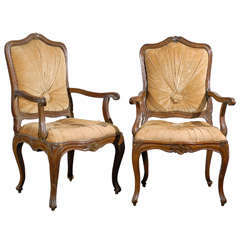 This handsome pair of 18th century Italian tall back chairs would make great hall chairs, or perhaps their rich walnut and dark leather would add some warmth and elegance to a study or other living area. Wear consistent with age and use. Leather is nicely worn, perfect for the look! Please refer to the various additional photos for further condition details. A Pair of Italian 19th Century Walnut Wood Armchairs with Cabriole Legs and Nicely Carved Skirt and Crests. Pair of 18th century Italian carved walnut throne chairs with nailhead detail. 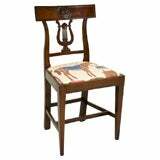 18th century Italian walnut side chair. A pair of Italian late 18th-early 19th century walnut hall chairs with lyre shaped carved backs. 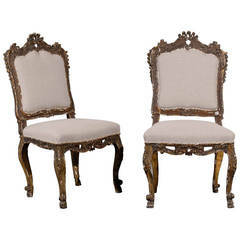 Pair of 18th Century Rococo Chairs.